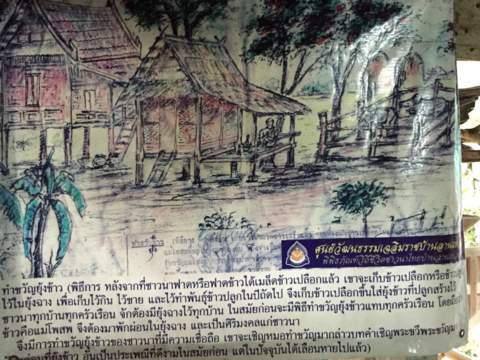 The Thai Rice Farmers’ Museum in Nakhon Pathom is the fruition of one man’s dream to preserve the way of life and cultural heritage of the rice farmers in Thailand. 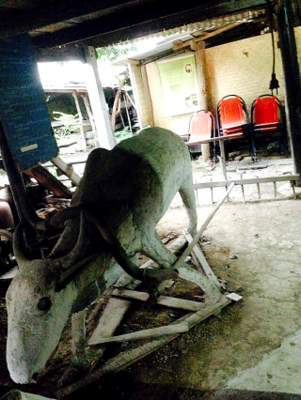 This museum is not to be confused with the Thai Rice Farmers’ National Museum in Suphanburi. 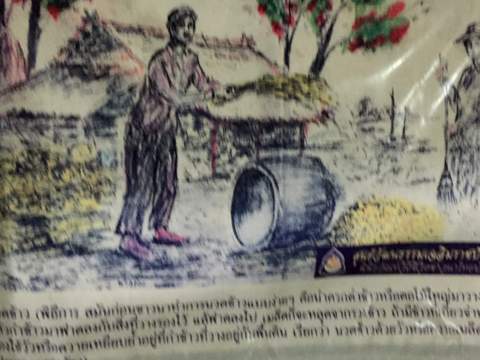 Lung (uncle) Rengchai Chaemniyom, 77 a retired school teacher had a dream to preserve the old way of life in Thailand, that of the rice farmer who made his living from the land. 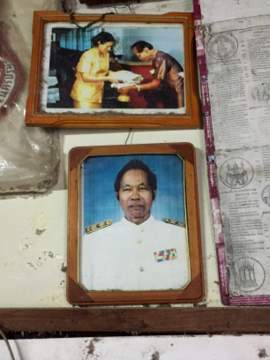 Both Lung Rengchai and his wife Pa (aunt) Payom grew up in rice farming communities. After he completed his schooling, Lung Rengchai worked in the Government Savings Bank. He later switched to teaching in a rural school to be near his roots, among the rice fields, forests and waterways. Traditionally farmers, who were allotted land, clear and cultivate the land to serve their daily needs. As far as possible, local material was used for their buildings and tools. They derived their livelihood from the land with enough to live by. Whatever was left after their daily needs were satisfied was bartered for other goods or sold. On the fringes of the rice fields, were ponds for rearing fish, crabs and prawns, vegetable and fruit gardens to cater for other food needs. It was a life of self-sufficiency. Inspired by a love for the land and fond memories of the rural way of life, Lung Rengchai established the Thai Rice Farmers’ Museum to preserve an aspect of Thai culture and way of life that’s a national heritage, a source of traditional knowledge and wisdom. 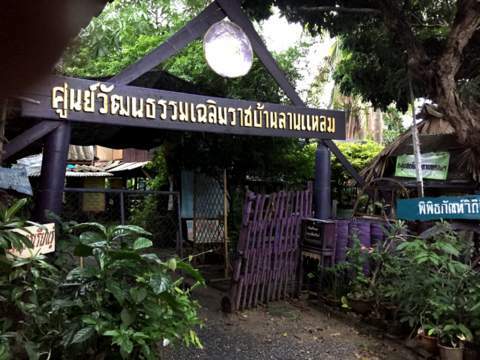 The Thai Rice Farmers’ Museum is located on one rai of land (1,600 sq m or about 0.4 acre) owned by Lung Rengchai and established on 19 September 1998. 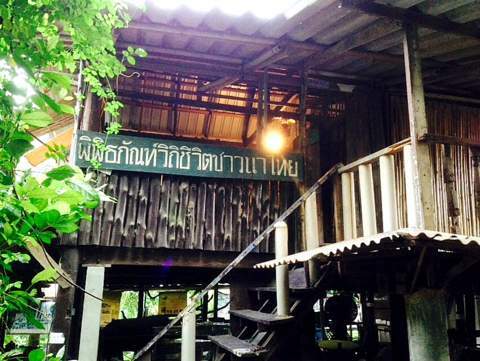 It consists of two wooden buildings; an open shed and a traditional Thai house on stilts. 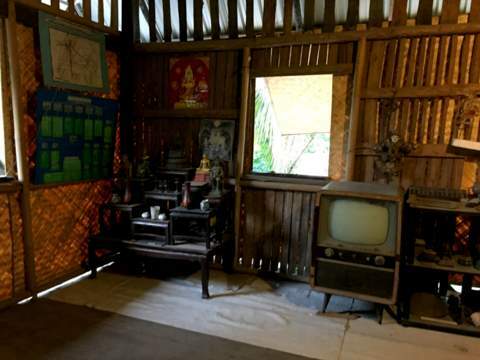 The traditional Thai building on stilts preserves the old way of life with a hall which serves as a living and sleeping area and an old kitchen from way back. There’s also a veranda in front where guests are received and meals are taken. The second building, an open shed displays all the traditional farming equipment and old household items collected over the years. The displays on one side of the shed caught my eye. 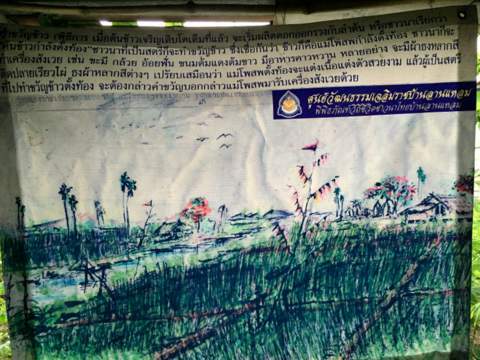 These are simple display boards illustrating the traditional stages in rice cultivation. I grew up on rice and in recent years I have often wondered what it took the rice farmers to produce the rice for our meals. This was the opportunity to find out. 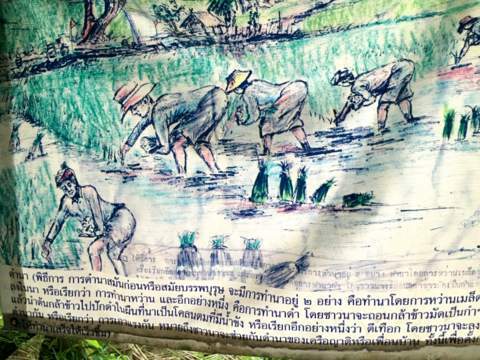 So let’s follow the stages of rice planting and relate them to the exhibits in the museum. Assuming the land has already been cleared of vegetation, the first stage is ploughing to break up the soil in the field. Traditionally this was done with a single blade plough pulled by a buffalo. The process of harrowing is slightly different from ploughing; ploughing goes deep and leaves lumps of soil behind, harrowing is done closer to the surface of the soil. The harrow is shaped like a rake with multiple tines. Harrowing is meant to break up the lumps of soil left behind by ploughing and to rake up roots and stumps buried in the ground. As the buffalo is the main beast of burden in these activities, it has to be well-fed. In the mornings, buffalos are usually taken to the fields to graze. When they are in their pens at other times of the day, they are fed with hay. 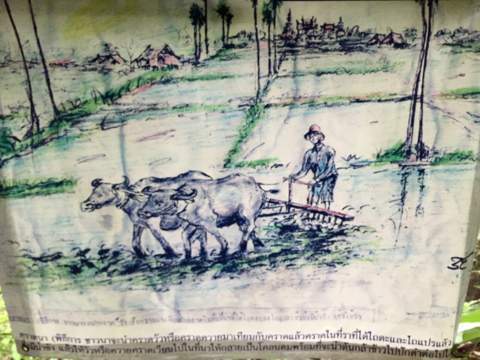 There are two planting methods, the first is merely to sow the rice seedlings in the flooded fields, a process called seeding (na wan) and let them grow without transplanting. This process doesn’t give a good crop because the rice plants will be growing too close to one another. 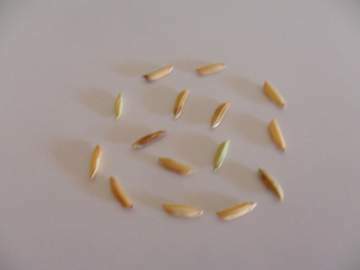 The second method (na dam) the rice seedlings are soaked in water then sowed in a seedling bed and left to sprout. 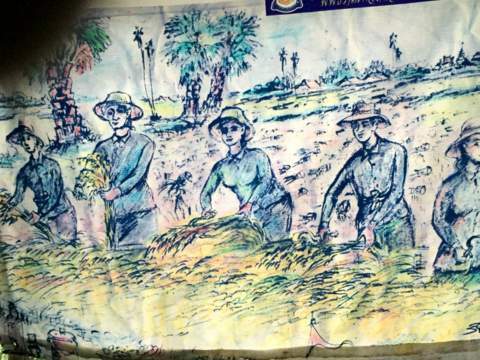 When rice starts sprouting, the sprouts are pulled out and bundled to be transplanted in the main rice fields. This is a backbreaking task as farmers have to bend low to push the sprouts into the flooded rice fields but gives a better and more productive crop as the rice plants are growing at regular intervals. In the old days, neighbours go from house to house and help one another with the planting and harvesting. Harvesting back then was done manually. The harvested stalks of rice are bundled together and threshed against a hard surface to separate the rice grains from the stalks. 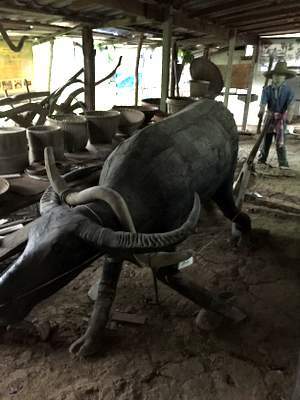 For large volumes of harvested rice, buffalos are used to thread over the rice to break the grain off from the stalks. After this stage, the rice grains are put through this device to clean off the leaves and twigs that may be mixed with the grain. This process is called cleaning the rice. 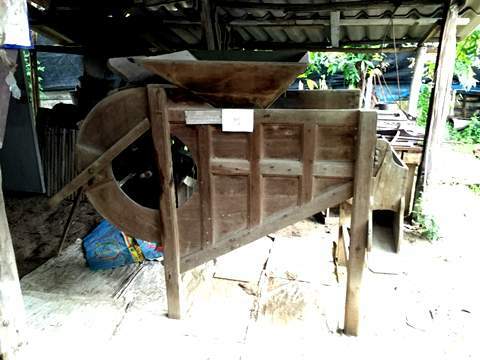 The rice grains are inserted from the top, the operator turns the axle connected to the wheel, the chaff is blown and emitted through the chute on the right and the clean rice grains from the left. If the rice grains are damp they are first dried in the sun. This is necessary to prevent rotting during storage. Damp rice also fetches a lower price. 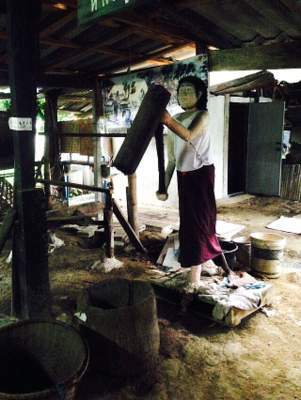 The rice grains are placed in a wooden cylindrical container and pounded with a thick pole to separate the husks from the grain. In the process of winnowing, the mixture of grain and husk is poured onto a rattan tray and thrown in the air so that the lighter husk and chaff will float away leaving the rice grains behind. With modern technology, mechanical equipment was developed to assist farmers in lightening their work load. 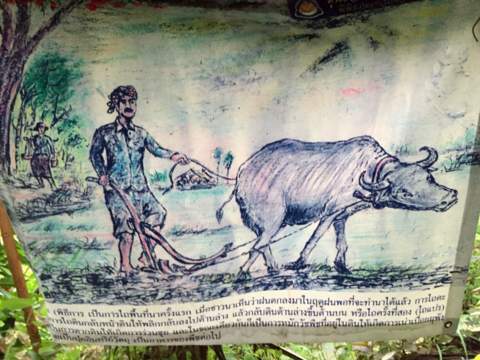 First tractors adapted with ploughs are used to replace the traditional water buffalo. 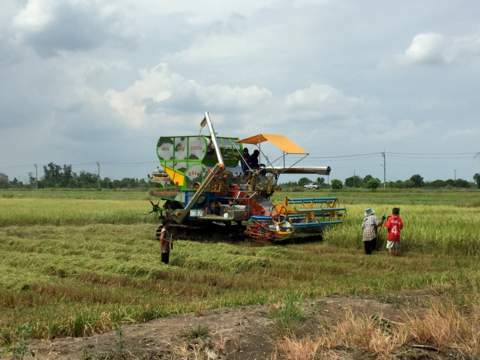 Mechanical harvesters harvest the rice and thresh it as well to separate the grains from the stalks. These harvesters are rented out to the farmers; rates are according to the size of the rice field. The rice grains with husks are dried and delivered to rice millers who mill the rice to remove the husks. This in turn is sold to rice exporters who polish the rice grains in huge silos and pack the rice into bags for export to wholesalers and retailers. 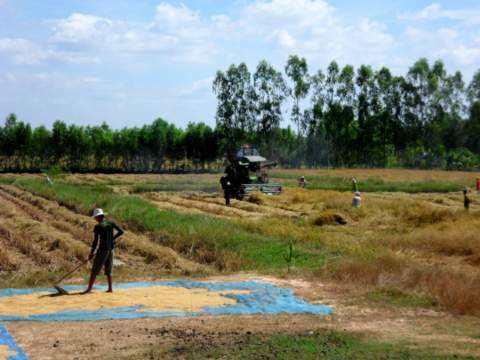 Once the rice is harvested, threshed and sold to the rice millers, it’s out of the farmers’ hands. The rest of the value added along the production chain doesn’t accrue to him at all. It’s ironic that the people who toil the hardest in producing the rice are rewarded the least. Colourful flags attached to a pole are implanted at the edge of the rice field and as the spirit is female, ladies usually partake in this ritual to call on the rice spirit. Bananas, hard boiled eggs and other delicacies are placed in krathong (containers made from banana leaves) and hung from poles. Children love this ritual as they get to eat the deserts after the ceremony. 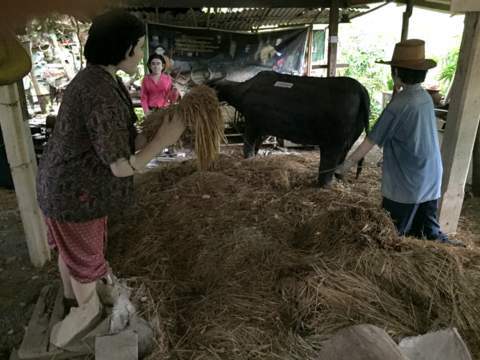 After the harvest and threshing the rice grains are placed in a barn together with offering of sweets and deserts as a form of thanksgiving for spirit of the rice barn (kwan yung khao). 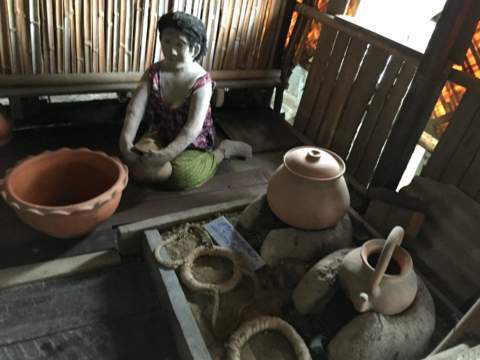 Besides the rice farming displays, other activities in the Thai Rice Farmers’ Museum are the organisation of housewives’ groups that develop the community by engaging in agricultural activities and handicraft work. 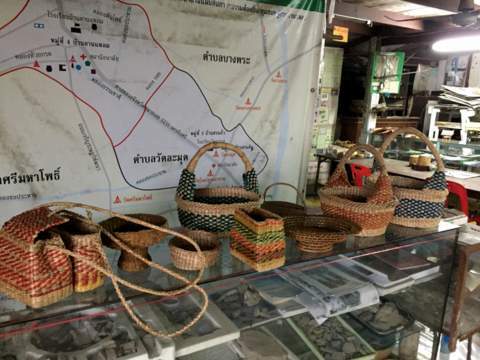 Of particular interest is the handicraft group which does basketry and wicker work from water hyacinth. This activity clears the vegetation that impedes the flow of water that causes pollution and derives benefits from local materials. Water hyacinth has very high water content, fibrous tissue, energy and protein. The stem when dried makes strong twines for ropes and wickerwork. Other environmentally friendly uses of water hyacinth are for fertiliser, fuel and animal feed. 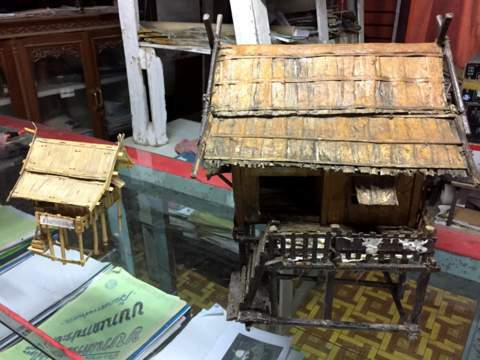 We are grateful to Lung Rengchai for taking us around his museum even though it was closed for renovation and for the information provided to write this article. All photos are with the courtesy of the Thai Rice Farmers Museum except for the photos Nong Chok district Bangkok and Surin. This article is dedicated to the rice farmers who produce the rice for our tables through their hard labour. May they be blessed with bountiful harvests in the years to come. With that we come to the end of our 2015 issues of the Bangkok Travelbug. We’ll be starting a brand new series in January next year with new visits to other places in Thailand of cultural and historical interest. So see you next year! Cross to the west bank of the Chao Phraya River at the Phra Pinklao Bridge and get onto Borommarachachonani Road. Alternatively, cross at the Taksin Bridge - Ratchapruek Road - Borommarachachonani Road. Avoid Phetkasem Road to the south because of the congestion caused by the train line construction. Turn right into Phutthamonthon Sai 4, head due north till you reach the Mahidol University at Salaya. Turn left into Highway 4006, drive on till you reach Highway 3223 then turn right to Highway 3223. Continue on till you pass Wat Lamut. The Thai Rice Farmers’ Museum is about four km after Wat Lamut and it’s located on the left. The museum will reopen in early December 2015.